I have been running staff development sessions in the FE sector for the last 3 years or so looking at the use of social media in learning. I am starting to notice a shift in attitudes. At the beginning, back in 2009, using tools like twitter for learning was a very niche activity. Most people I spoke to were bewildered by the idea of social media and even more by the idea of using it for learning. Then, in 2010 as social networks such as twitter and Facebook became more popular I went through a phase of pure hostility whenever I mentioned such things to a group of teachers. This hostility was accompanied by people saying that new media was the domain of just young people, that it stopped them socialising ‘properly’ and that there were all sorts of child-protection problems associated with it. In FE colleges in particular a year or so ago, many were actively blocking such sites through their firewall. I argued at the time that doing this was the equivalent of the little boy in the legend trying to stop the dyke flooding by putting his finger in the leaking hole. More recently, people’s attitudes have softened: the two institutions I have been working with in the last few months, Colchester Institute and Stanmore College are examples of this. Instead of hostility I have noticed some fear and trepidation but most of all a willingness to engage with new technology and an openness to thinking about using it for learning. At the beginning of the line are those people who said they didn’t have a favourite website – this was because they barely use the internet and when they do it is simply to look things up. So when pushed, these people might say Google or the BBC website. Then there are people who have started to discover some useful sites, mainly used in their personal life such as eBay, Amazon and Trip Advisor – these people are beginning to move into a more two-way relationship with the internet. Then there are those who have started to use social networks a lot such as YouTube, Twitter and Facebook. Finally, there are those people who have the same answer as those at the beginning of the line, “I don’t have a favourite website” – these are people who use the internet as an integrated part of their life. They don’t even see the internet as a collection of websites but more a tool to organise their lives and they access it on their phones, tablets, laptops, TVs and games consoles. This is the ubiquitous web. Where are you on this spiral? Where are your colleagues? If you are struggling to get permission to use new technologies it is likely that those people you are trying to persuade are very much at the web 1.0 end of the spiral – they simply don’t understand how the Internet, for some of us, is an integral part of our lives – it’s truly becoming ubiquitous. Just as many of us can’t leave the house without our mobile phone, some of us can’t imagine going through a day without engaging somehow with other people online – through a blog, Facebook, Twitter, LinkedIn or a news website. 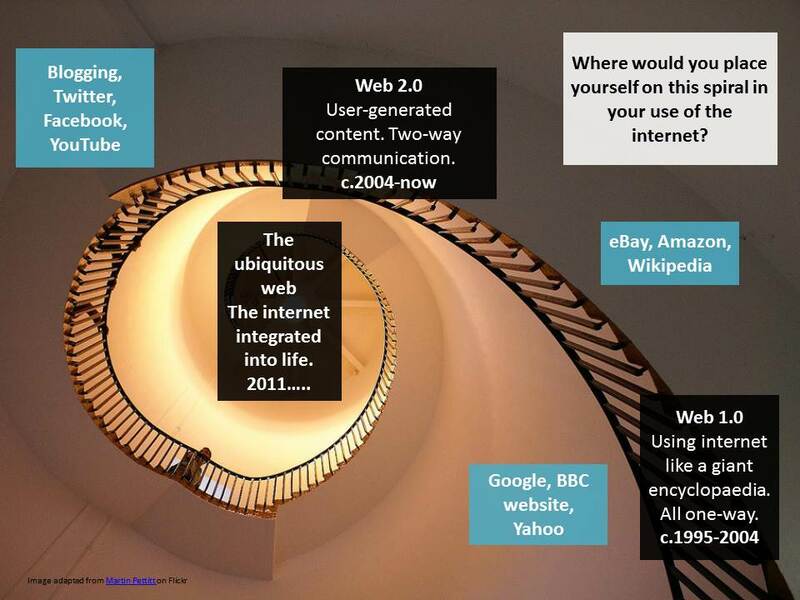 The key to persuading people is in helping them to understand this spiral which reflects the development of the Internet over the last 10 years or so. Ask them what their favourite website is – it will reveal a lot to you and help you to know how to win them over. Share real life examples of how the different tools you use have impacted on your teaching, your learners, your business or simply your quality of life. Let’s get educating those naysayers! Next What do people need? That’s really interesting… I didn’t start using the internet intensively until about 1997 when I discovered IRC. I was using online journals and keeping a blog (not my current one) long, long before the 2004 cutoff point in your diagram. For me, the bulk of my online activity has always been social.